Public radio plays a major role in my three-months on Cooper Island each summer as I observe the Black Guillemots, the melting sea ice and the displaced polar bears. To the extent that there is a “field camp culture” on Cooper Island, listening to the radio is a major part of that culture. Whenever I am in camp, and not out in the colony censusing guillemot adults or weighing nestlings, I almost always have the radio on and tuned to the only local radio station for hundreds of miles, KBRW, broadcasting from the village of Utgiavik (Barrow), 25 miles away. The information, entertainment and companionship the radio provides is most important during the extended periods (up to six weeks) when I am the only person on the island. While I may not see another human for weeks on end, I am able to hear them on a daily basis. Earl Finkler had a morning show on KBRW for decades, and in the early 1980s I stopped by the station after leaving the field to tell him how much I enjoyed his playing “It’s a Beautiful Morning”, by the Young Rascals, on bright sunny mornings – and how it always lifted my mood. For many years after that Earl would give a shout out to “all the listeners” on Cooper Island before playing that song. When videographer/photographer Art Howard spent a few weeks on the island in 2007, as part of the International Polar Year, he saw firsthand my personal relationship with KBRW radio. 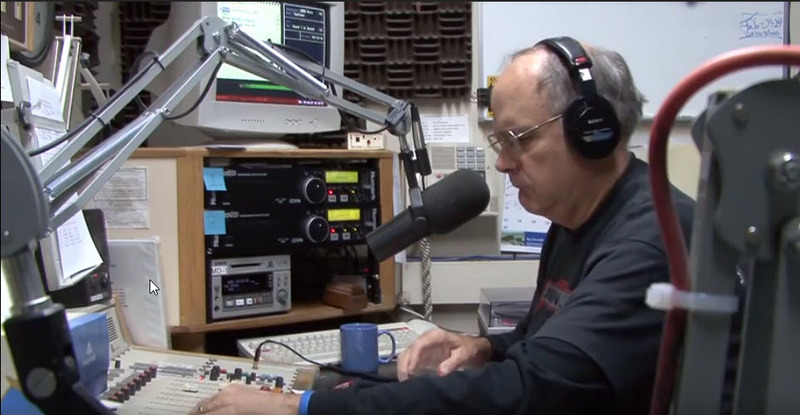 As a result, his video on the Cooper Island study, starts with Earl in the KBRW studios playing “It’s a Beautiful Morning”. As Hannah Waters recently pointed out in her article for Audubon, “Every day goes about the same on Cooper Island” and familiar voices on favorite radio shows come as welcome and important breaks in the fieldwork. There are two reasons I might find myself running back to the cabin from the guillemot colony – either a polar bear has arrived on the north beach or one of my favorite radio shows is about to come on the air. The duration of my time on Cooper, and the vagaries of public radio programming, has meant that voices and programs that were once major parts of Cooper Island life no longer can keep me company, such as Steve Heimel on Talk of Alaska and Neal Conan on Talk of the Nation – although I now do have Neal’s podcasts of Truth, Politics and Power brought out to me by visitors and get to see Steve in Anchorage before and after the field season. While Earl Finkler has left Utqiagvik, his replacement, Bob Thomas, has a weekend show with hours of well curated vintage and oldies tunes that will be going through my head the rest of the week. One of the other voices I used to hear on KBRW was that of Gabriel Spitzer, who was on Alaska Public Radio when he lived in Anchorage. Now, like me, he resides in Seattle where he is at KNKX and the host of Sound Effect, a weekly tour of ideas, inspired by Puget Sound and its residents, with a different theme being explored each week. They recently invited me to be part of a show called “Pet Projects” to talk about my 43 years on Cooper. The 10-minute segment on Cooper Island gave me a chance to share information about my climate change findings but also covered a range of other topics that make up the Cooper Island experience, including how monitoring the guillemots’ social lives helps me get through periods when I don’t have one. 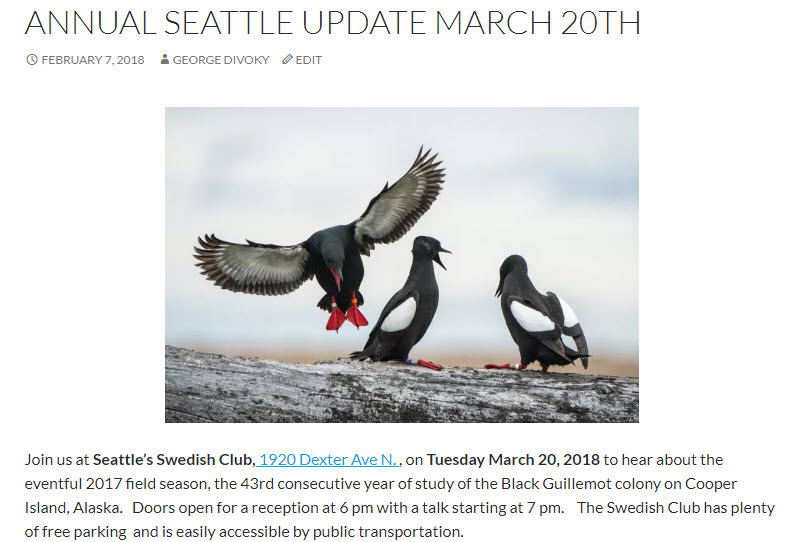 If you want to hear more about life on Cooper Island, Arctic climate change and the eventful 2017 field season, please come to our annual Seattle event on the evening of Tuesday March 20th at the Swedish Club. I also will be giving a presentation two days later at the monthly meeting of Eastside Audubon on Thursday March 22nd in Kirkland.